After a lifetime of being dog obsessed, we know one thing for sure – dogs are the glue that holds life together. They’re a constant rock there to listen attentively, kiss away your tears, and make you laugh. We love dogs, and we know you do too. 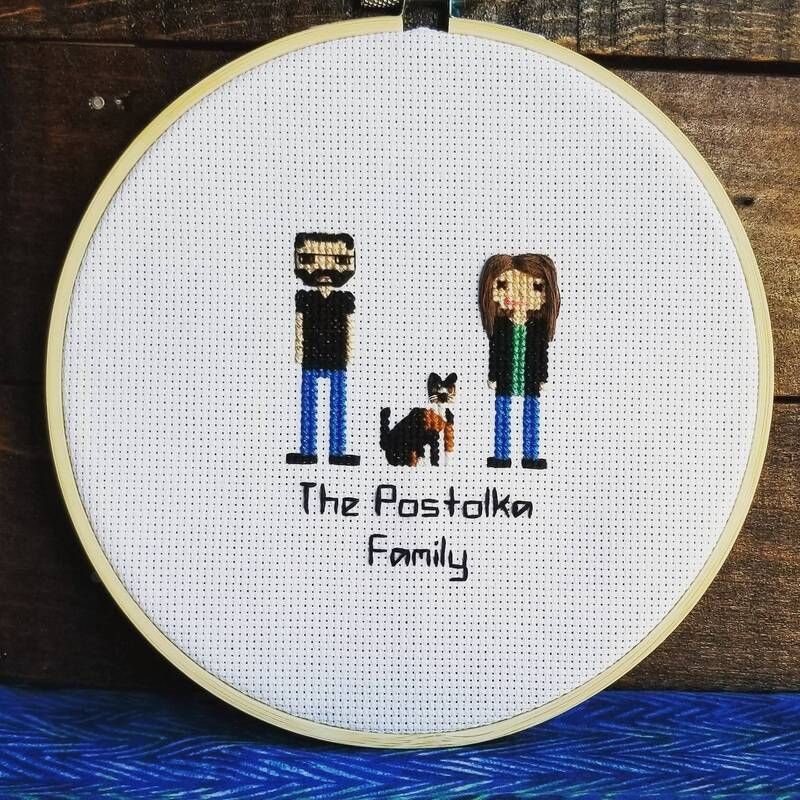 We wanted to create and capture that love in a unique way, one that makes the best custom unique gifts for you, your, family, your coworkers and friends. 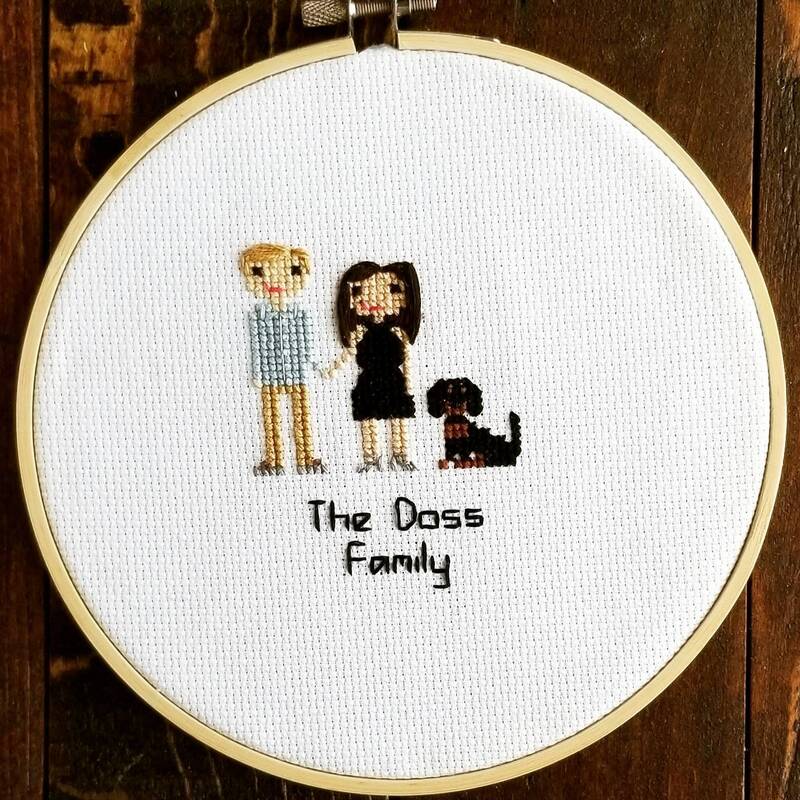 A custom cross stitch family personalized portrait makes for the perfect gift for any engagement present, wedding anniversaries, birthday, graduation, or just because! 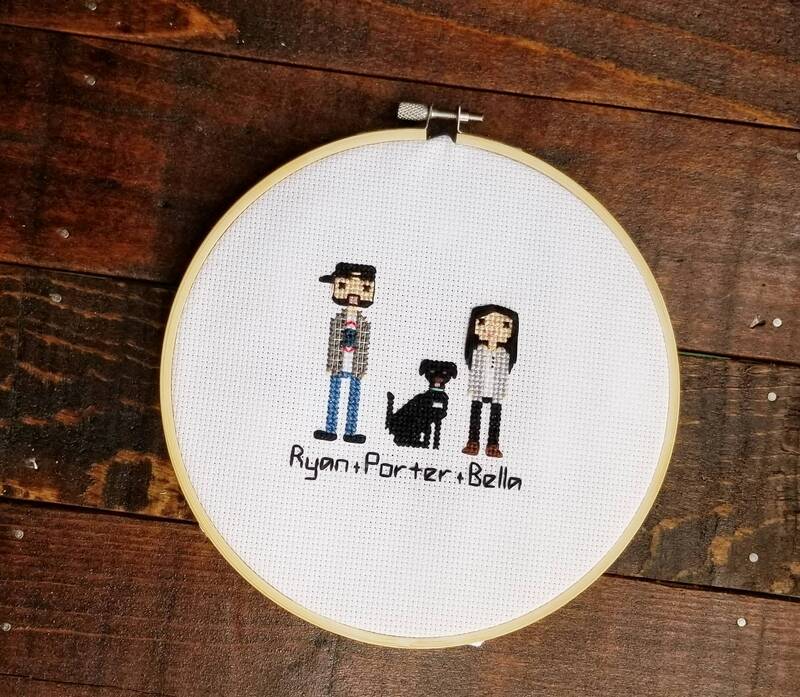 Each custom cross stitch people portrait is hand stitched to your specifications on 14 count Cotton Aida fabric, using DMC floss, stretched on an embroidery hoop. 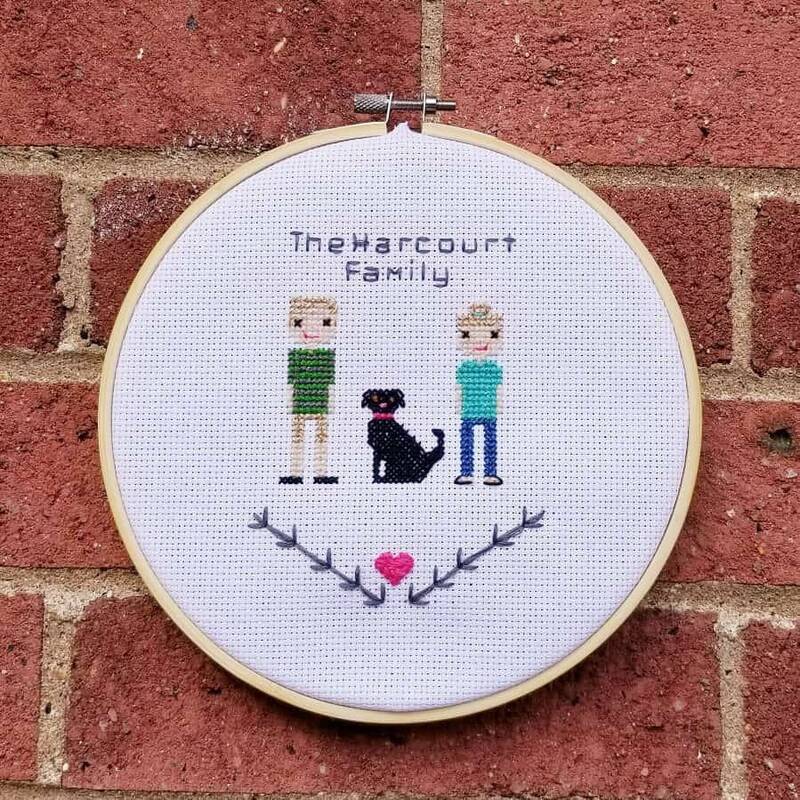 Once completed, the portrait can be shipped as-is for you to put in your own frame at home, or it can be left on the embroidery hoop (which is a pretty cute décor addition!) for you to hang! - Several photos you feel best represent the people and pups in the portrait. - Hair preferences (up-do, down, shaggy, bald, etc.) – eyes will be black on all portraits to create a standardized look. - Clothing preferences – does Dad have a favorite striped sweater you want to show? Anything detailed will help – the more ideas the more accurate it will look! - Text (if any) to be listed below figure(s) – i.e. : name, date, special quote/saying, etc. - Any additional information you feel would make the people and pups look cute! Wagamuffins will contact you with any questions or concerns & confirm your order and ship date! Each portrait is handmade and made to order meaning that it can take up to 3 weeks (though we will aim for less, of course) HOWEVER…the clock begins ticking ONLY once we have received complete information including photos, descriptions, etc. Until that time, the order will remain on hold as we won’t know exactly what you want or who the pups/people are to begin the work! The better the communication, the faster the portrait can be created! Life is hectic, we know. And because it's hectic we totally get that getting a present for your friend's birthday slipped your mind. Now you need something ASAP! What's a person to do? Luckily, we've got a RUSH option that'll do the trick. For an additional fee of $25.00 we can create your custom portrait in as little as 5-7 business days. If this is the option you would like to go with, please message us directly *prior* to checking out so we can go over all details together! Like the people and pups in the photo but feel you want to add a little somethin’ somethin’ extra? No worries, we’ve got ya covered! Let us know what element you’d like to add and we’ll make sure it accents the portrait just right! Portraits are meant to have a cartoon-ish look, as depicted in the examples of the listing. This is not an exact portrait, but rather an artistic recreation. Wagamuffins reserves the rights to all artwork created. It turned out so amazing! 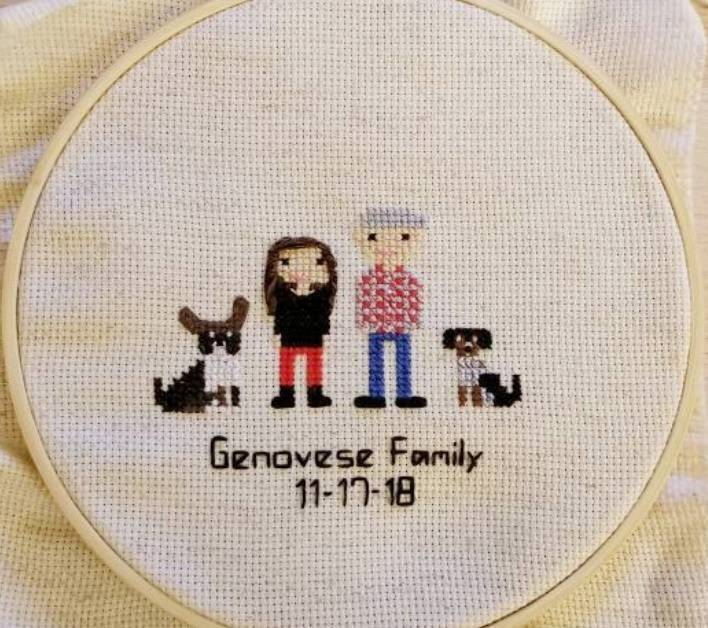 It shipped so quickly, and she patiently worked on all of my little requests until it was perfect. 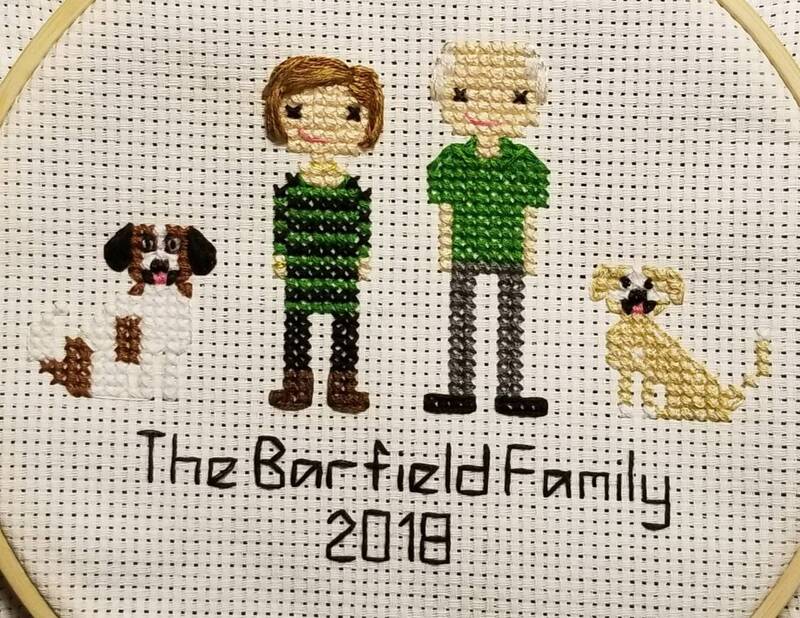 I can't wait to give this to my friend. Thank you so much! 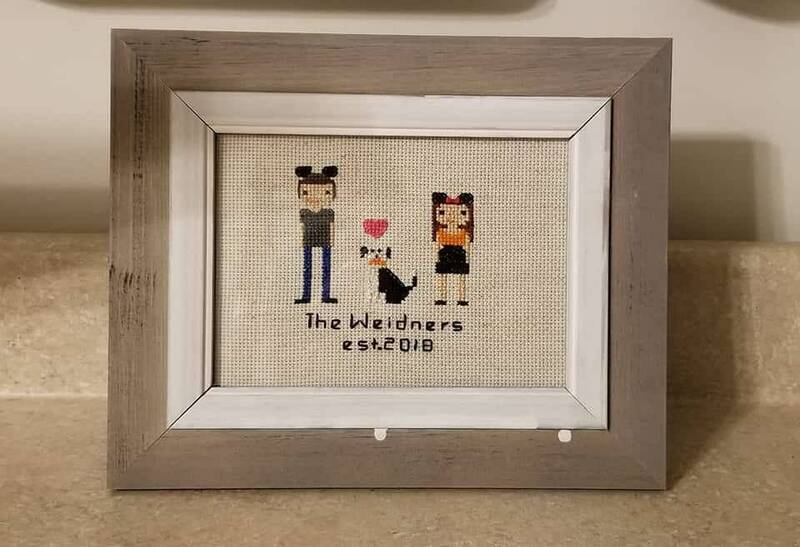 I LOVE the sign I had made for my sister in law for Christmas. 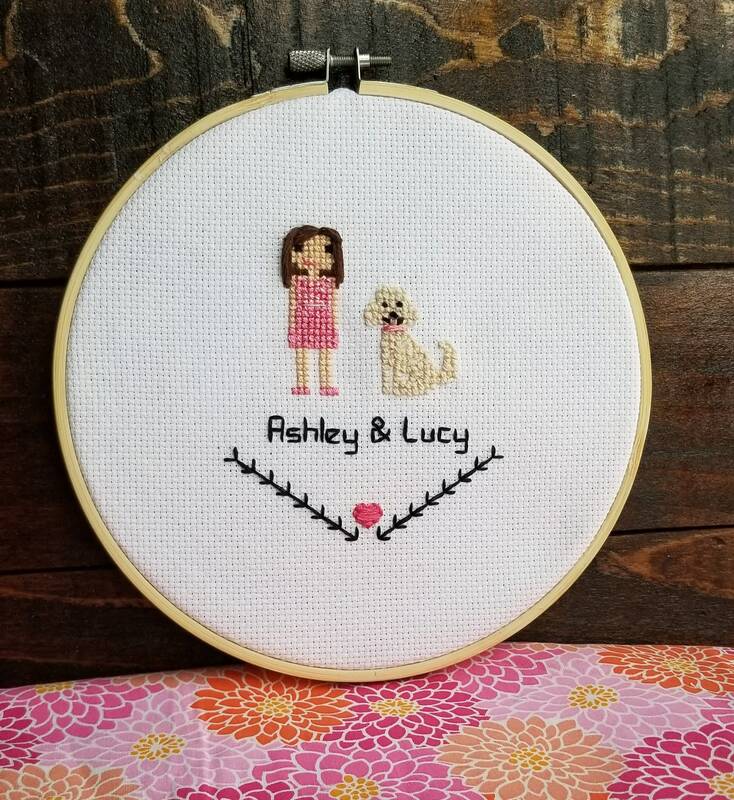 My daughter, who can't read, looked at it and said, "that looks like Aunt Ashley and Lucy!" I'm so impressed with the quality, the likeness from the photo I sent, and how quickly she got it done! She was easy to communicate with and gave me a wonderful product for a great price. I'd definitely recommend her and this shop!! 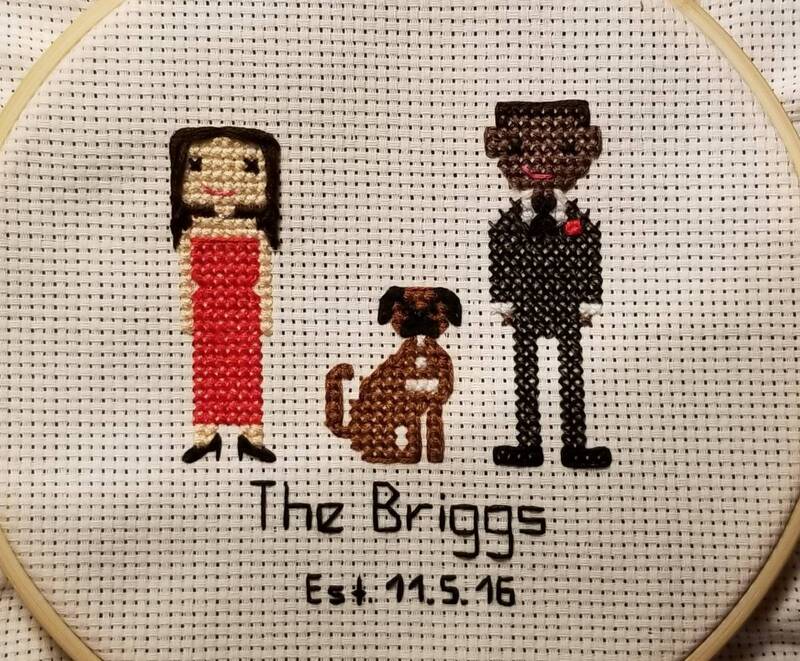 Bought this for a wedding gift, absolutely loved it. Megan was very accommodating and awesome to work with. I will be purchasing another in the future. I love love love this so much! Cannot wait to give it for Christmas! Couldn’t be a better product or better service! <3 Thank you!